Lost Girls love adventure and travel, but what happens when a Lost Girl has a baby? Even though motherhood is an exciting and rewarding new role, it is easy to imagine that the new family member will cramp travel plans and replace them with a much more domestic lifestyle. Is it possible to balance motherhood with being a Lost Girl? 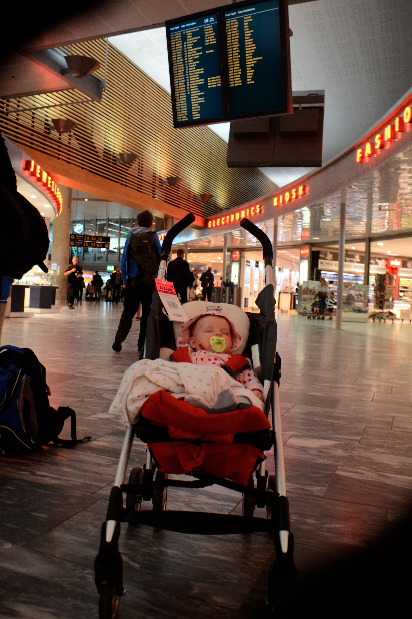 Here are some factors to consider when traveling with a young baby. New mothers may be overwhelmed by the degree of sleep deprivation that they experience the first few months of a baby’s life. Travel is likely to steal into the already diminished sleep a new mom gets. Consider splurging at a higher end hotel where you and your baby are comfortable. This is not the time for “roughing it” in low cost accommodations. If you nap with your baby every day at home, you will probably need to do so while traveling. Plan for enough downtime and plan on staying in one location for several nights in a row. Travel with a partner, close friend, or family member who can give you a break from the baby duties once in a while. Some hotels or resorts offer baby-sitting services. Traveling with the young baby who doesn’t yet crawl or walk can be substantially easier than traveling with the older baby who has more needs in terms of physical activity. A three-month old baby will probably be content to snuggle with you on an entire flight, and will sleep happily in the carrier while you browse the local antique market. A ten month old will want to crawl, grab, and practice walking, and she will sleep less. Babies under six months don’t yet need solid food, making feeding during travel a much easier process. Health care professionals are fairly unanimous; Breastfeeding is better for baby’s and mother’s health. Breastfeeding is also the easiest option during travel since food is readily available at all times. Many countries are a lot more relaxed about public breastfeeding than the US. Research the country’s “nursing culture” before you leave. Bring a small breast-pump and a bottle so you can express milk for a babysitter if you plan to use one. If you are using formula, bring enough formula for the trip and make sure you get water from a safe source. If your baby’s bottle needs to be warm, you need to plan feeding times and locations. Babies feed every 2-4 hours. Add in diaper changes, tummy time, and clothing changes, and it becomes pretty clear that most activities take a lot longer than they did when you were traveling alone. Plan for a one-destination trip with a generous time budget. Consider spending your time exploring your destination in depth at a more leisurely pace, while people watching and chatting with the locals. Don’t plan too many activities each day. Traveling babies need plenty of gear. In addition to the normal diaper bag, you will need to pack anything that your baby would need at home to be safe and comfortable, including medications. Consider whether you will be able to buy diapers and wipes at your destination. Most airlines will let you take a compact folding stroller with you at no extra charge. Invest in a rain-cover for your stroller if you are not guaranteed dry weather. A good quality carrier like a Baby-Bjorn is a great investment since it will allow you to get off the pavement and to visit places where stroller access is limited. Pick a destination with a decent health care system and check with the CDC (http://wwwnc.cdc.gov/travel/destinations/list.htm) regarding any vaccinations or health risks associated with your destination. Always check with your pediatrician before planning a trip with your baby. Think closely about the type of activities, environment, and climate that will be comfy and safe for both of you. Your baby will probably not enjoy a long day on a hot and sunny beach, but may love to explore an old city from the safety of a carrier or stroller. Jet lag will affect your and the baby’s sleep. Consider whether this it the time to visit destinations in Asia and Europe, or whether it may be wiser to select destinations in the Americas in order to minimize the jet lag factor. Use your judgment to make traveling safe and interesting for both your little one.